It has been said that the purpose of psychology is to help us understand our experience. 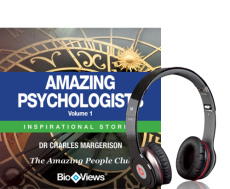 This great collection of audio stories explores the lives of some of the world’s most fascinating psychologists. Meet Dr Ivan Pavlov, most famous perhaps for the work he did with dogs to better understand what is known as the ‘conditioned reflex’. Understand what inspired and motivated him and the implications for society. You’ll also meet influential thinker Carl Jung, the founder of analytical psychology and a major figure in the development of dream analysis. Explore the life of Karen Horney, a pioneer in the field of psychoanalysis and the psychology of women. Responsible for influential books including The Neurotic Personality of Our Time, she founded the Association for the Advancement of Psychoanalysis and the American Journal of Psychoanalysis. Known as the mother of modern management, Lillian Gilbreth is a lesser-known character but no less amazing. She pioneered industrial management techniques which are still in use today. Lillian was a prolific author, the recipient of many honorary degrees and mother of 12, as well as an engineer and an influential industrial psychologist. Each story comes to life through BioViews®. These are short biographical narratives, similar to interviews. They provide an easy way of learning about amazing people who made major contributions and changed our world.